Alice in Wonderland, is the new Disney Interactive iPhone game made for the new Tim Burton film of the same name. 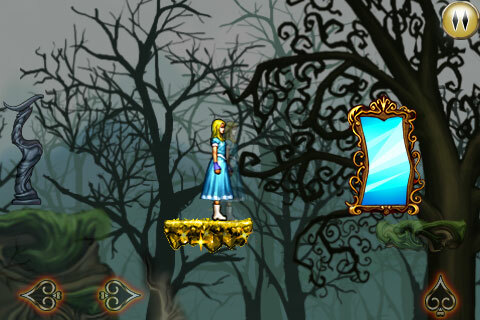 Featuring Alice in a puzzle based strategy game, the virtual controls are provided for moving Alice left to right using directional buttons and jump with a jump button, as you encounter magical objects and new characters. To switch between characters you tap on Alice and choose another one to transform into, and use their special powers to get past various mazes. You can also interact with most objects in the game by tapping on the action button in the middle of the screen when it shows up. If you remember playing Pitfall on the Atari you’ll have a good idea for the Alice in Wonderland style of play and movements around on the screen. There are lots and lots of tricky areas where you’ll have to find combinations of movements and powers to make your way across the large map. Making wrong moves will get you stuck until you find a way out. There are subtle clues and speech bubbles that try to help. The Journal is where Alice keeps her magical items from Wonderland, including Photos, In-Game items, GPS apps, Riddles, and dates. These goodies are unlocked using various methods, such as being in the right place physically, answering questions and also for finding them in the game itself. The soundtrack music is brilliant and very fitting for the game. Graphics and interface are well designed and colorful. All the animations are smooth but at times using the run and jump buttons simultaneously can be tricky. Perhaps having an option to use tilt for running might be a good alternative here. The jump button not only jumps Alice up but also moves her forward which is nice when needed but can be awkward sometimes. Running past the poles with torches serves as a checkpoint, however if you quit out while in a level, you have to start that level over again. The Alice in Wonderland game for the iPhone and iPod touch sells for $4.99 and you can try a light version for free in the app store. Grab a copy and be sure to watch the upcoming movie Alice in Wonderland: An Adventure Beyond The Mirror. AppSafari review of Alice in Wonderland was written by Joe Seifi on March 4th, 2010 and categorized under App Store, Featured, Fun, Games. Page viewed 19831 times, 9 so far today. Need help on using these apps? Please read the Help Page. does anybody know how to get past the level where the flowers blow you in the water? im having trouble getting out of the hares house. i keep ending up in the same spot. where is the march hare? Does anybody know how to get the last piece of the mirror in level 3? Ooommgg I am soo stuck lol…Stuck on alice in wonderland ipod touch game!!!? Same! I get stuck after the key in the hare’s house 2. In that room with the spikes, tilt the iPhone around until the wooden blocks fall to where the last door is. Then you’ll be able to get there. Stuck at last piece of mirror part in door maze…help! how do you pass the part that ytou have the key to the locked door in the march hares house. im stuck behinde the mirrior. HELP! i need help getting to the key. i have met the march hare, but i have no idea what to do after that. i can see they key, but its a floor below me. and i jus don’t know what to do. help? I got out of the hatters house and now I have to go in and out of doors where you flip the iphone. I went through the second door and got the key to open the door but there is no platform to stand on to get to the door. Can anyone help me??? I am at the part when I have to find the mad hatter. How to I get pass the spikey thingy. I’m stuck in the house as well! I can get the key then have nowhere to go due to spikes! Tilting iPhone doesn’t do anything for me, either! Someone please help me!!!!! How do you get the key??????? does anyone know how to get the last piece of the mirror on the door maze?? How do you get the key? I’m stuck trying to get to the mad hatter. Please help! Just completed the game and absolutely love it! How wonderful. You are right the instructions are just right. I cut and pasted them into word so that I could break them down more, but I finally got out of the Hares house!!! I would have never figured that out….not sure if it is quite fair really to put so much out of sight….but anyway thanks to that person for posting the instructions! How do u get past the part where you first meet the hare and have to move the boxes and spiky bush??? 2 platforms that need to help you finish the game. 1st platform’s the one that moves horizontally across the whole row of spikes after you’ve collected the key. You’ll need to freeze this platform at EXACTLY the location of the 2nd closet from the left (do this before you go collect the key). So that after you’ve collected the key and you come out of the door, leading you to the room with the row of spikes, make the cabinet disappear and jump down the hole, and you’ll fall onto the frozen platform. 2nd platform comes after you’ve landed safely on the left side of the room after the above. at the bottom of the screen, you should see a vertical spiked platform moving left and right below Alice. Use Hare to move this platform to the same platform Alice is in, and use Hatter to move it to the other side of the mirror. Go back to mirror image, following behind the vertical platform, and use Hatter to transfer the cabinets backwards so that platform can pass through to kill the guards there. tap on Alice when the tree is down, and you’ll get to choose to change into Rabbit. Once you’re in Rabbit form, touch the tree to freeze it. change back to Alice to go onto platform. To get the tree to come back up, change back to Rabbit to unfreeze it. I am on Alice in wonderland app on my iPhone on part 4. I am stuck. I met the March Hair and got past the bush. Droped the blocks and moved them on to the blue flames but if I put one on top of each other I can’t jump up on top. But if side by side is to far from the wall to jump up. What do I do? I am so lost? I’m stuck again…I’m out of the Hare’s house, and now I went through a bunch of doors, and got stuck in a room where you have to tilt the iphone…i can make all the blocks block the spikes, but I can’t get through the door! Help me, please! please help! i’m stuck in the garden which you have to find the heart and the spade, i find the spade and i need to get to the last mirror piece that’s on the platform underground, but it’s too far too jump! help me please! i tried at least twenty times already! how do i get the key to the march hare’s hourse? i can’t find it anywhere! thank you. ok, I made it in to thru the front door of the March Hares house. I moved the mirror and went thru it. In the mirror world there is a vertical spiked platform. HOW DO I GET OVER THIS?? It’s been driving me crazy all night. Tried reading the walkthru Angel posted but couldn’t make sense of it. I’m stuck on the maze of doors to get the mirror pieces after the march hares house. Does anybody know the right order? it’s starting to annoy me haha. I need help finding the key to the march hare’s house.. I also cannot get past the level where the hare tells you to go to the second floor where the mad hatter lives. There is nowhere to go. Someone please help!!! Email me and/or respond on here. kmaurer06@hotmail.com THANKs!!! Kendra, finding the hatter was tricky for me. That part you have to move the platform from the bottom ‘blue dot’ to the one above it, and you have to be on the upper level or you wont be able to get back up. after you do that, you’ll be able to go to the top level where you will find the hatter through a door. I Neeeeeeeedddd help getting through the March hare’s house and fining the Mad Hatter!!! Please, Please, if you know how post a tutorial! I’m stuck in the march hares house, I don’t kno how to get the mad hatter n I need his ability to get any further as the spiky things in the room have the pink swirls. I entered the front door of house, if I walk to far there’s a gaurs that will. Stab me. Just before the gaurs is a mirror floating I move the mirror w mar mch hare n go through it. In th mirror u go through there are 2 big spiky things one frozen w pink swirls n gold sparkles the other nothing but sideways slide. I tried the tutorial but can’t work out where it’s talking about. Xan anyone help me. There are always two guards. kill guards by using boxes. Mad Hatter will help. use all 6 boxes and make steps to go up. Hope helps you a little. I am in the very beginning of the game. I just got the cat and i had to go through a door to get the three missing pieces of the mirror and i have no idea which way to get out. ? So I am in the wierd looking bunnies house (the one with one ear up and other one down) and idk but I am trying to get this key and idk how I have tried everything but i don’t kno what to do ? Hellpppppp pleaseee anyoneeee ?!!!!! Okay so I need help seriously I’m stuck at part where you have the boxes and gotta use them to climb up to get piece to mirrors and then shattered mirror has guard in front and one in front of mirror after that. Help please!!!!! Select the march hare and place the boxes over the gaurds (where the flames are). Then select the white rabbit and let the two boxes drop. They will fall on the gaurds and get rid of them/ crush them. I’m at the hares house and go through the front door looking for hatter and I move the mirror so I can go through it but I can’t get past the vertical spikes. Can anyone help ? I have just got in to the front of the hares house. I moved the mirror and went into the mirror room. There are vertically floating spikes that block the way and there is no way past. Pleaseeeeeeeee hlp! HELP I am at the March Hare’s house and cannot get the key? Does anyone know how to do this part?? Does anyone knows wich pictures should we take for the journal!! Im stuck ! Help!!! Um, hi I beat the game but im still not shure what all the journal pics are supposed to be. The one on the bottom right is a piece of art, a drawing, or painting. The one above that is a statue,(does not have to be humongous, just a statue of some sort.) I dont know the other two though so if you know please share! PLEASE HELP!! I’M STUCK ON THE FOURTH PLACE ON THE MAP! HOW CAN I GET PAST THE PLACE WITH THE TWO MIRRORS AND THE CRACK(the one where you go in it and there are blue lights on the floor)PLEASE PLEASE HELP!!!!!!!!!!!!!!!!! Hey, um… just a tip. Don’t post your personal phone numbers online for the world to see. It’s not as safe as you think it is. Okay so I’m at the part where the hare tells me to get to the third floor. I put the thing that goes up and down on the flames at the bottom but there is no way to get past that that i see. Anybody know what im talking about? If so please help!!!!!!!!!!! Im so lost! HELP!!!!! im in the garden and i cant figure out how to finish the mirror world when you enter the garden! PLZ HELP!!!!!!!!!!!!!!!!!!!!!!!!!!!!!!!!!!!!!!!!! !